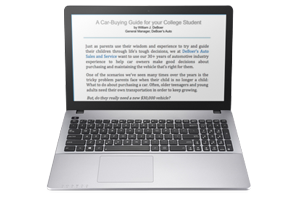 Our eBook prepares you with a strategy for setting your college driver on the road to success. The guide reviews the process of buying a reliable pre-owned vehicle and outlines the ways to finance the purchase as well as deal with insurance. We hope that the guide is helpful in assisting everyone, parents and students alike, to experience a stress-free process in buying a car that is safe, reliable and the best economical choice. Enter your Name and Email Address in the form and we will email you a copy!